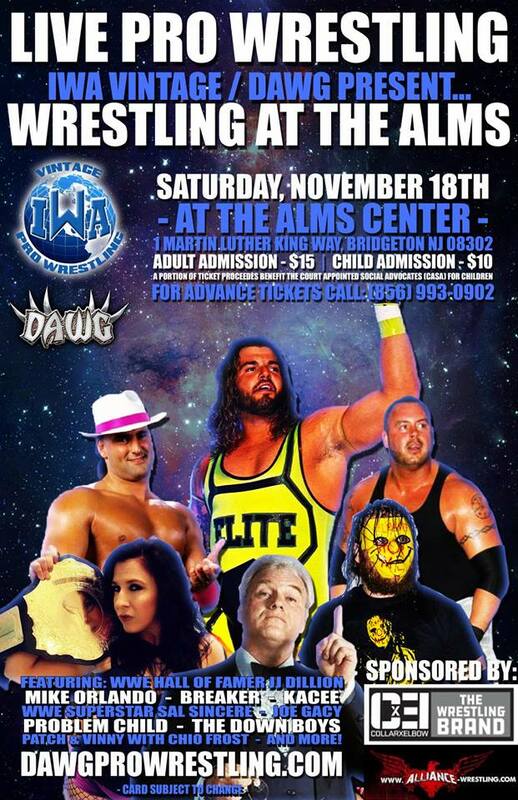 IWA-Vintage and DAWG have combined their efforts to put on a big show in Bridgeton New Jersey. 4 Championship titles will be on the line on November the 18th, including the WWGP Champion in action. Main Event - WWGP Championship Match: The "Incredible Huck" William Huckaby (C) vs "Prince of Camden" Desean Pratt. As we announced earlier The Legendary Leader of the 4 Horsemen will be at the Alms Center November 18th in the corner of Stephen Gibki and Tony Vincita as they challenge the Old School Empire for the DAWG Tag Team Championship. Its fitting that the man to challenge the King of the WWGP, William Huckaby is a Prince. The "Prince of Camden" to be exact. The reputation of our WWGP Champion made it very difficult to find someone brave enough to take this match, but Desean Pratt stepped up to the challenge. The Main Event for Live Pro Wrestling at the Alms on November 18th at the ALMS is The "Incredible Huck" William Huckaby defending against the "Prince of Camden" Desean Pratt. This 1st time ever match up will be one for the ages & I guarantee that you will be talking about both wrestlers in a positive way after this match is over!